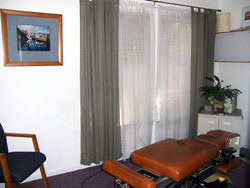 Dr. Shaw’s patients enjoy her expert adjusting techniques. The emphasis in Craniosacral Therapy is to help resolve the trapped forces that underlie and govern patterns of disease and fragmentation in both body and mind. This involves the practitioner “listening through the hands” to the body’s subtle rhythms and any patterns of inertia or congestion. Through the development of subtle palpatory skills the practitioner can read the story of the body, identify places where issues are held and then follow the natural priorities for healing as directed by the patient¹s own physiology.